Researchers at Carnegie Mellon University are working on a new generation of disaster drones that can be deployed in swarms into buildings to give first responders a look inside, mapping out the interior as they go. The drones could be valuable in situations such as those faced recently after massive explosions ripped through a port in Tianjin, China, or in the aftermath of a smaller event, like a house fire. "These places are very dangerous for rescuers to go, so we don’t want to just blindly send people inside," said Pei Zhang, an associate research professor at CMU's campus inside the NASA Ames Research Park in Moffett Field, California, where the research is taking place. "Instead, we want to get these things in before people go in and determine if there are people that need help," he said, gesturing to several drones on the table in front of him. 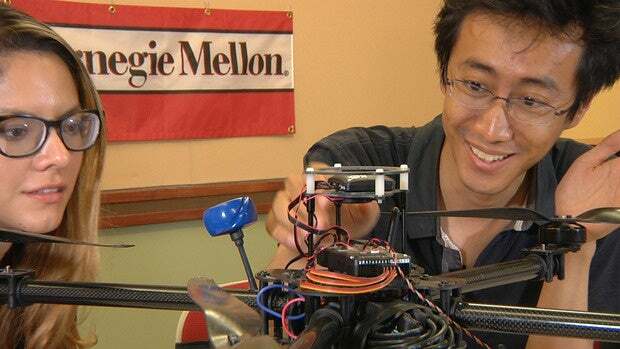 Zhang Pei, an associate research professor at Carnegie Mellon University, explains the technology behind a drone on July 2, 2015. Zhang envisages using a larger drone, which he likens to a mothership, to carry multiple smaller drones into whatever environment is being explored. The smaller drones would deploy from the large drone and begin their work. The larger drone, he reasons, has a longer range and can better handle wind and other effects of the environment. But it may be too large to send inside somewhere like a building that's been compromised by an earthquake. So the smaller drones, some of which can easily fit in the palm of a hand, would fly inside to do their work. Because they're small, each drone will carry fewer sensors but Zhang says that doesn't matter because there will be more of them and they'll communicate with each other over ad-hoc peer-to-peer networks. "We can put a lot of these inside a building," he said. "They can fly into walls, and because they are light they'll hit the wall and nothing will happen, but [the drone] will know where the wall is and communicate that." 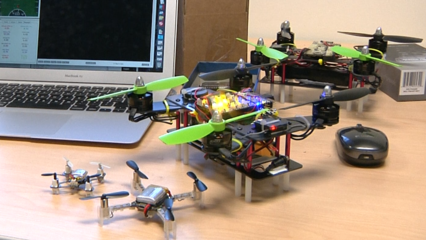 Through trial and error, the tiny drones will build a map of the inside of the building. They'll also carry additional sensors to measure whatever is required, such as the temperature, air quality and even radiation. All of this information will be sent back to controllers via the mothership, which also carries a camera to provide a live video link. Zhang's current prototype mothership drone can fly for about 30 minutes, and cover about 10 miles (16kms), a time and range that he wants to improve. The small drones are all still very much works in progress and the researchers have been working on miniaturizing their payloads so it can fit on smaller devices. A drone flies through the air during a flight test at Carnegie Mellon University's Silicon Valley campus on July 27, 2015. 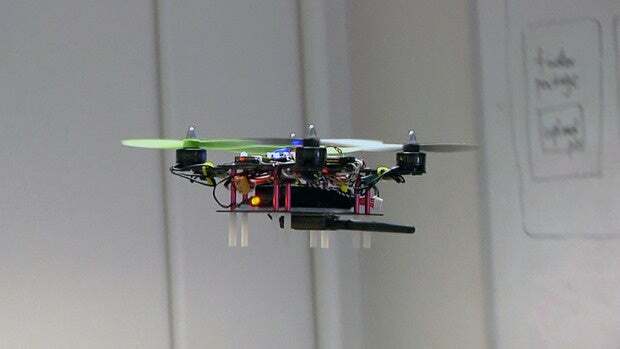 The group's research is currently focused on giving the small drones a greater degree of autonomy and building up the sensing capabilities of each one. Zhang thinks it will be about 10 years until the work is out of the lab and lands in the hands of users such as rescue workers, law enforcement and the military.